Amid rumors that Apple will release its first iPhone models with wireless charging capabilities as early as this year, its possible partner Energous has told The Verge that its first truly wireless transmitters will begin shipping by the end of 2017, over two years after it first introduced the technology. Energous CEO Steve Rizzone also dropped yet another hint suggesting its partner is indeed Apple. "One of the largest consumer electronic companies in the world," he said. "I cannot tell you who it is, but I can virtual guarantee that you have products from this company on your person, sitting on your desk, or at home." 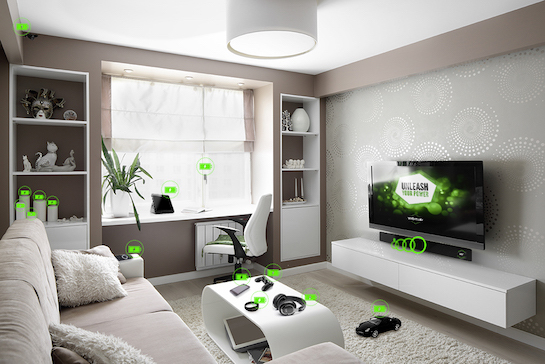 Energous is the company behind WattUp, a truly wire-free, over-the-air charging technology that uses radio frequencies to charge devices from up to 15 feet away. If you walked into a room with a WattUp transmitter, for example, a smartphone with a built-in WattUp receiver would automatically begin charging. Energous today announced that its WattUp technology will be embedded in six products on display at CES 2017 this week, such as the Chipolo Plus Bluetooth tracker and a SK Telesys hearing aid, but these implementations will require small, contact-based, portable transmitters rather than the larger, truly wireless transmitters coming. The company said these early devices integrated with WattUp receiver technology will be able to seamlessly transition from being charged by the contact-based transmitters to forthcoming larger transmitters that offer over-the-air charging at-a-distance of up to 15 feet, seemingly by the end of this year. There is plenty of anecdotal evidence to suggest Apple and Energous have partnered on wireless charging. Energous has claimed it is working with "one of the top five consumer electronics companies," it has relationships with Apple manufacturers TSMC and Foxconn, and both Apple and Energous are members of ANSI. Energous certification documents dating back to 2014 were also uncovered with an "Apple compliance testing" listing, and Apple supplier Dialog Semiconductor recently made a $10 million investment in Energous. Dialog makes power management chips and is said to get as much as three quarters of its business from Apple. The deal Energous made reportedly gives its mystery partner first dibs on shipping its truly wireless charging technology "inside of phones, laptops, tablets, and certain wearables and accessories," and given the multiple rumors from credible sources, it appears one of those products could be the next iPhone. Given that Apple has removed the headphone jack on iPhone 7 models, leaving the Lightning connector with the double duty of charging and connecting wired headphones, the move towards wireless charging would be appropriate. Cue the concerns about how this might affect our physical health (yes, in my ignorance, I think I'm one of those who's concerned). I'm genuinely concerned with yet another type of "wave" bouncing around inside my house. And call me one of those "get off my lawn" types - but would we really know how safe it is now? Or in 10/20/30 years after it's been used a long time. but honestly I would be worried about safety. Do I want electromagnetic radiation strong enough to charge a phone flying through my house or car that I am exposed to continuously? I don't think so personally. If Energous's tech is so amazing, why doesn't Apple just buy the company? Maybe Apple discontinued the current Airport lineup (rumored) because the new one will do both wireless charging and internet? Maybe even speaker/smart hub/microphone, etc. Wireless charging sounds cool. But will it take longer to charge a device? And what if any health concerns are there? It doesn't matter how long it takes to charge the device, forget running the phone to 10% and then plugging it in, the idea is you'll trickle charge it ALL the time no matter which room you're in with a transmitter, it should be slow, but just fast enough to continue to charge the phone in a positive manner when in heavy use, thats all thats needed, to keep it topped up, not fast charge it from 0. Radio waves have been around long before humans, there are no health concerns - that doesn't stop people turning their wifi off at night though does it, or refusing to wear bluetooth headphones cos of zapping it straight to their (borderline useless) brains. If this works as advertised, Apple can totally get away with an iPhone 7S. now this is why apple waited to bring in wireless charging. it will be wireless charging basically without need wires to charge from the sounds. Why would you be exposed to it continuously? That'd just be a waste of energy. It should detect when a compatible battery is nearby and adequately depleted, it should charge it back to full, and then it should go back to passively waiting for another battery to charge. Maybe I'll upgrade my iPhone this year. My 6+ is still going strong... but I'm such a sucker for neat things, and this sounds neat enough. I had been planning on holding out for another year or two.